Potholes can certainly seem like the root of all evil, especially during these dreary winter months when people risk flattening their tires and derailing their cars every time they leave the house. 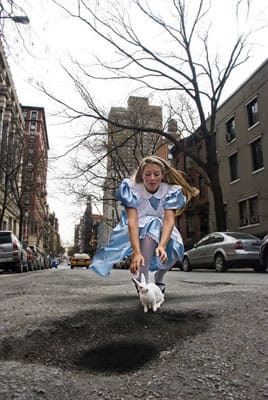 While there&apos;s nothing anyone can do about these roadside annoyances, except maybe call and complain, photographers Davide Luciano and Claudia Ficca have found a creative way to transform a driver&apos;s biggest nuisance into a series of photographs entitled My Potholes. "This project started as a humorous way to expose the ridiculous pothole problem in our hometown. Along the way we realized that sometimes we can&apos;t change things that frustrate us (like potholes), but we have the power to change our perspective toward those things," Luciano explained to Mashable. Thus, Luciano and his wife wandered the streets of New York City, Los Angeles, Toronto, and Montreal in search of potholes to create their latest project. Using a camera, elaborate props, models, and a whole lot of imagination, the two have re-created whimsical scenes from films like Alice in Wonderland and moments from ordinary life, too. If you can&apos;t beat them, embrace them, right?